Got a super-secure password? Maybe you shouldn't be so sure. 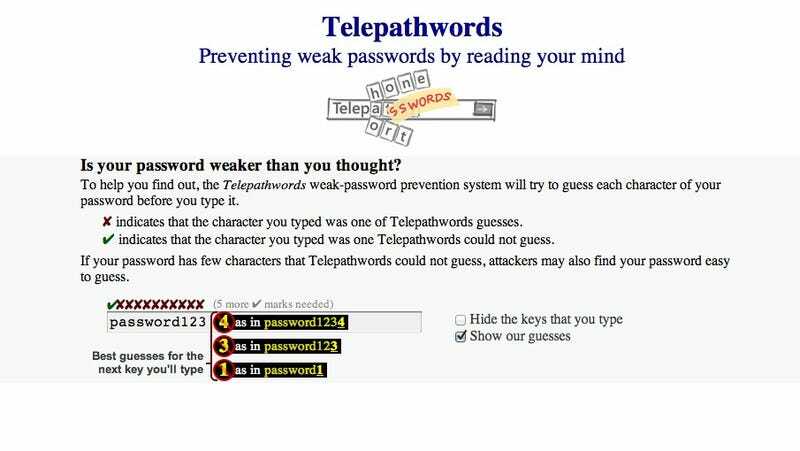 Telepathwords can help you find out, and practically read your mind in the process. The new project from Microsoft Research has a simple premise: you start typing one of your favorite passwords in its little text box, and it tries to guess what the next character is. And it's better at that than you might think. We all know that "password" and "123456" are bad news, but there a wealth of other patterns Telepasswords (or a good hacker) can recognize too, and if you can rattle your codes off by heart, there's a decent chance that at least one of them is at work. Somehow, Everyone&apos;s Password Is Still "123456"
Maybe not though. Maybe you are an an alphanumeric god with passwords that would bring the NSA to its knees, crying tears of concentrated shame. There's only one way to find out.